Our joint purpose is making Jesus known! We are stronger when we come together. As we build on each other’s ideas, we can create something extraordinary that brings God glory. We will begin with one day for Round Table members and then gather for several days as an AELF. Round Table members are the Area Leadership Team (ALT) and directors of a country, ministry or strategy. AELF includes the Round Table members and national leadership teams (including others with country-level responsibility), strategy and ministry leaders’ teams and executive agents. Félix Ortiz and Paul Duncan will be the facilitators. With Félix and Paul as guides, each leader will have the opportunity to explore the beliefs and emotions that keep us from moving forward. Because leadership teams will attend this year, we hope that teams can wrestle with the obstacles they face and make headway together. Felix Ortiz joined Agape staff in 1976. He and his wife Sara have two children, Andreu and Anna. In his many years on staff, Felix has served as the European Director of Staff Care and Development and in campus and training ministries. The author of numerous books and Bible studies, Felix travels around Europe, Latin America and beyond teaching and training pastors, staff members and people of all walks of life. Felix looks for opportunities to help people develop their full potential. He studied History and Education at the University of Zaragoza and later obtained two Master’s degrees in education–one in the United States and one in Spain. Felix and Sara reside in Barcelona, Spain and in addition to their leadership training work, they pastor a Christian community and have the passion to take the gospel to the postmodern generation. Paul Duncan joined Agape staff in 1985 working in the high school ministry in the United Kingdom. Paul is married to Henri who serves as the HR director of Agapé UK. Henri and Paul have two adult daughters, Rebekah and Katy. Paul serves as an Agape Europe LDHR executive agent. Before taking that role, he coordinated the youth ministry across Europe after leading the high school and youth ministries in the UK. Passionate about asking leaders questions to help them think and reexamine their assumptions, Paul looks for opportunities to change the world and play sport. He has a masters in coaching and mentoring from Oxford Brooks. Paul and his wife Henri live in Birmingham, England. What does AELF stand for? 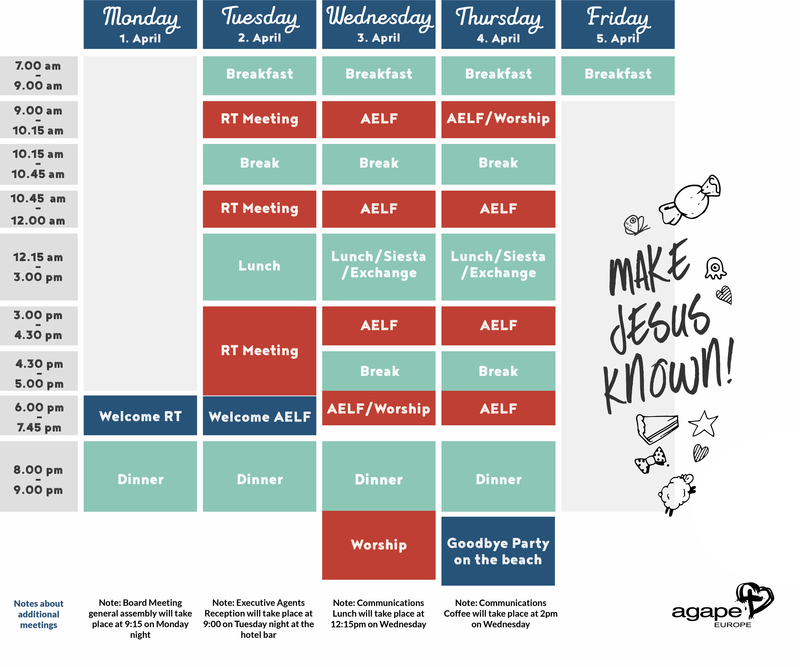 The Agape Europe Leadership Forum (AELF) includes all National Directors and their National Leadership Teams, the Area Leadership Team with their Executive Agents and the ministry and strategy leaders on the European level with their teams. When is the Round Table? This year, we will have one day for Round Table members and then AELF members will join for the other days. We want to LOOK Beyond where we currently are, be real about what’s holding us back, overcome obstacles and trust God for where He is calling us. God is calling us to reach cities and centres of influence across Europe. He is inviting us to step out in courage. He is opening new doors that require us to change the way we think and lead. Why do we do AELF? We believe this will have a ripple effect among our staff, facilitating more collaboration and partnership so Jesus can be known across Europe and beyond. What if I want to invite others to an event in my country or my ministry? If you want to advertise an event, conference or opportunity, please bring a printed poster (A4 size) to the welcome table by Tuesday. These will be displayed during AELF. Bring a water bottle, clothes for meetings indoors, a Bible, pen, notebook, toiletries and any items you want for the beach. Weather forecast here. What if I want to plan a special meeting for my team? Some groups have already scheduled meetings (see schedule below), and you may schedule your own meetings as you wish. Just save time for rest and reflection. Do I need to read or prepare anything? AELF Members, no need to read or prepare anything special. RT Members, remember to finish reading Canoeing the Mountains. Here is the summary. RT members can reimburse the book in their national ministry and each national ministry can tell Agape Europe’s Finance Team how much needs to be sent to them. Agape Europe will then send the money- one amount per country. Click here for more information about your airport to hotel transfer. How will I pay for AELF? The AELF conference fee will be charged to each participant. Check in at Sol Principe Hotel reception. Then, visit the welcome table downstairs starting at 17:00 on the night you arrive (Monday or Tuesday). The first meeting will be down the main white stairway. Round Table Members are expected to arrive Monday, 1 April 2019. The first session will start at 18:00. Book your flights early enough to arrive at the hotel beforehand. Check-in time at the hotel is from 14:00, but free luggage storage is available if you arrive earlier. AELF Members are expected to arrive at Málaga Airport (AGP) Tuesday, 2 April 2019. The first AELF session will start at 18:00, so be sure to book your flights early enough to arrive at the hotel beforehand.